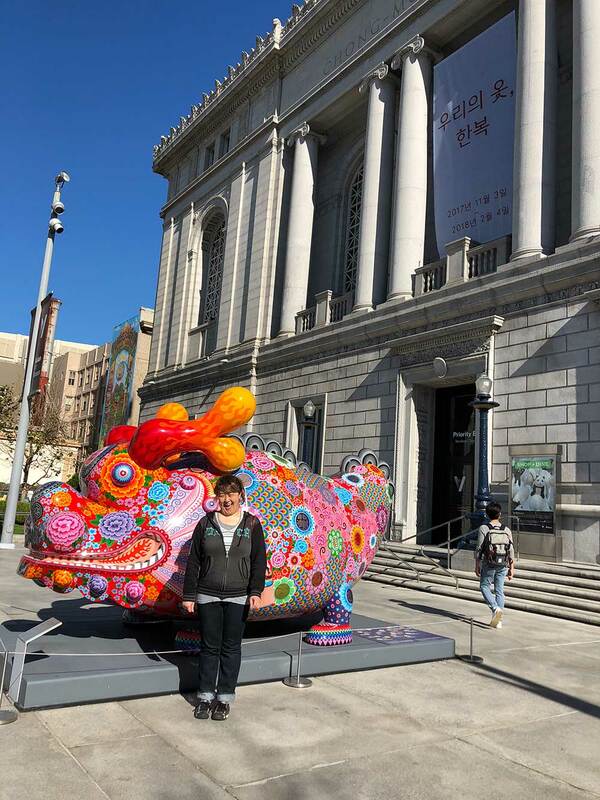 For all the drama you gotta put up with when you live in the San Francisco Bay Area — the hyper-inflated housing prices, the nerve-wracking traffic and the occasional tremblor — on the positive side, one of the most exciting, interesting cities in the world is nearby. 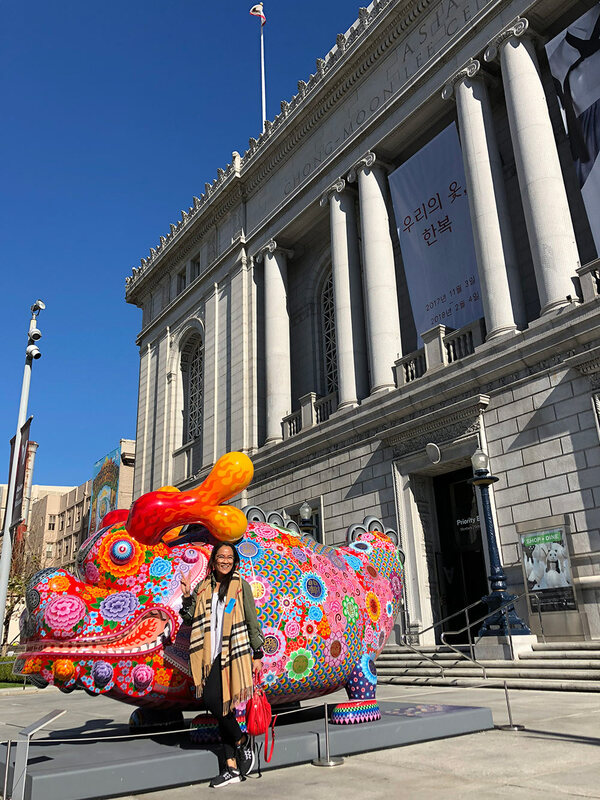 Yesterday I drove across the bridge to hang out with my friend Cindy and visit the Asian Art Museum, which is in the city’s Civic Center neighborhood (free parking on Sundays!). 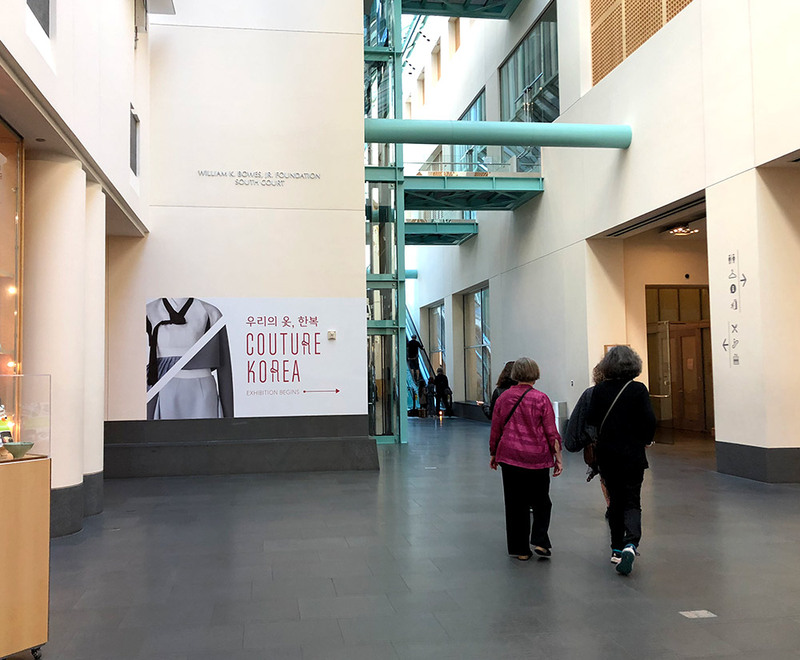 There’s a special exhibition going on now called Couture Korea, in which contemporary fashion designers create their own interpretations of traditional hanbok, the formal clothing worn during Korean holidays and special occasions. 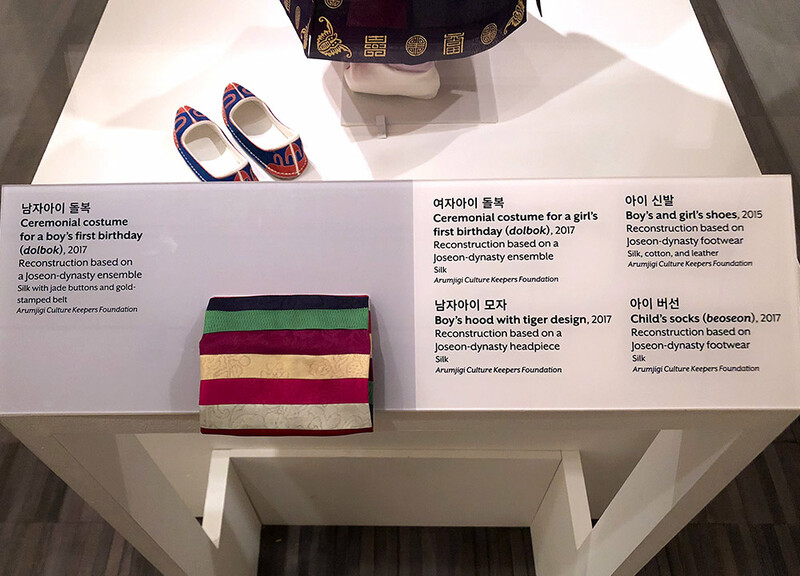 “Beginning with ‘What Is Hanbok?’ (traditional Korean clothing), the exhibition examines history and tradition. 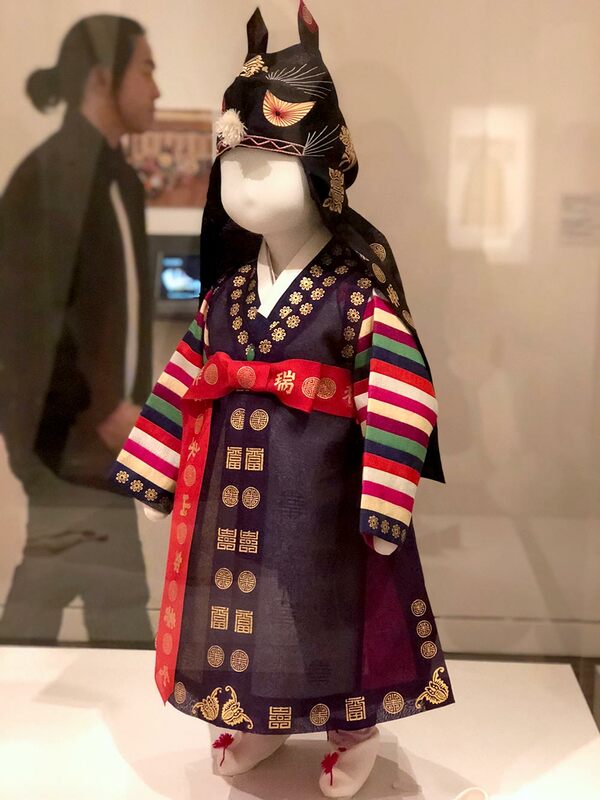 Emphasizing mid- to late-Joseon dynasty clothing of the elite class (yangban), the varied and sophisticated hanbok in the Osher Gallery highlight proper ways of dressing for men, women, and children, with garments expressing social status, changing seasons, and special occasions or milestones in life. 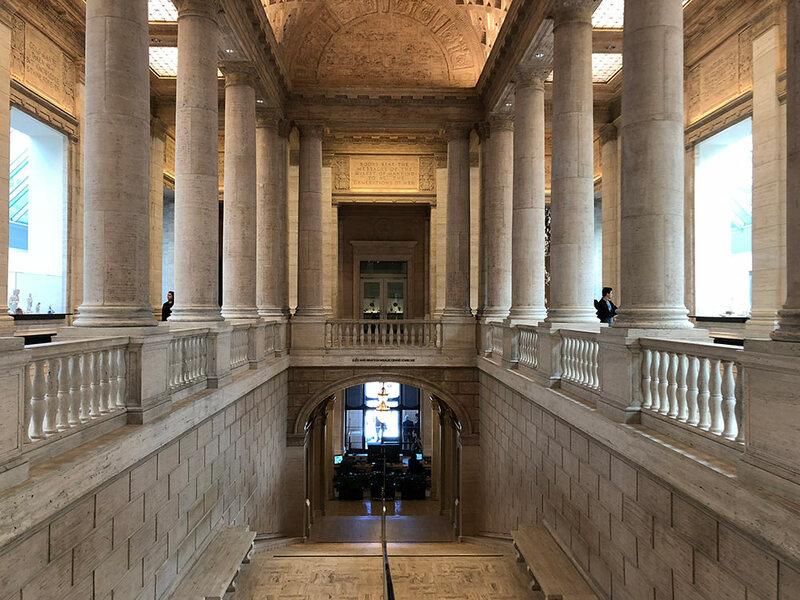 Don’t museums have the best lighting? They’re also usually pretty darn great at symmetry, too. And columns! 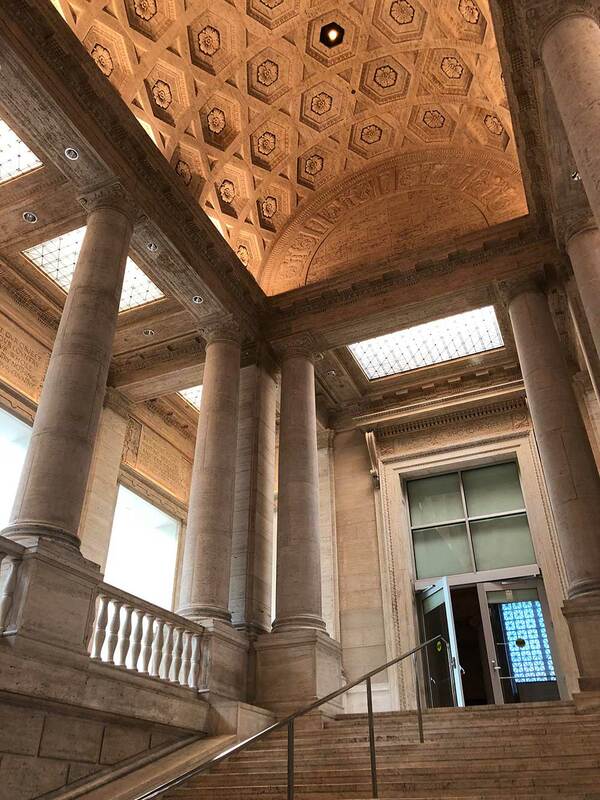 Museums ROCK the columns, man. 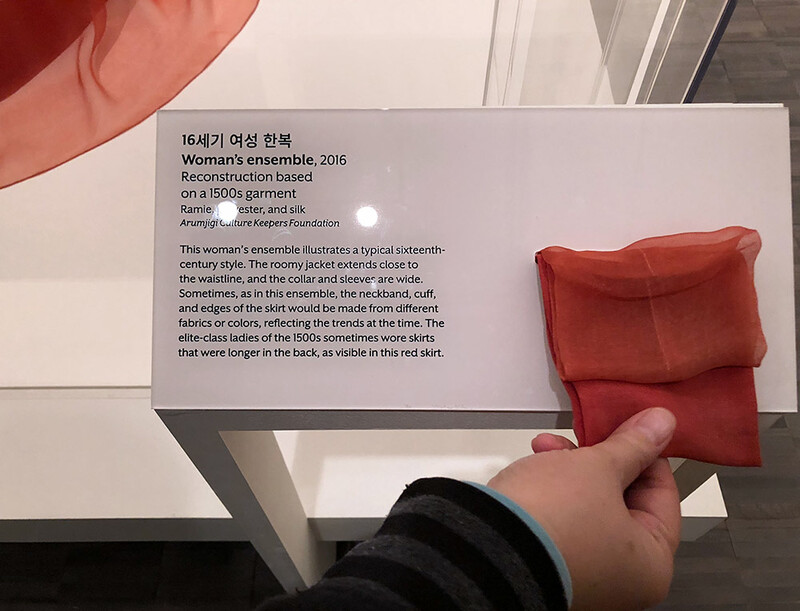 The dresses were magnificent, but they also had displays of fabric swatches that you could actually touch, so you could get a sense of what the dresses feel like to wear, like whether they’re stiff, soft, heavy or light. 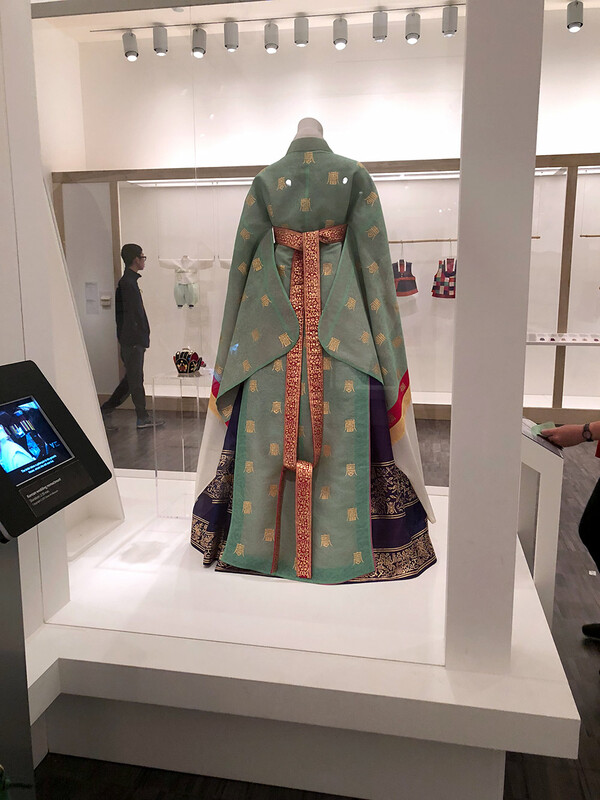 A lot of the hanboks were enclosed in glass cases, so you could circle around them and see the details in the back, too. 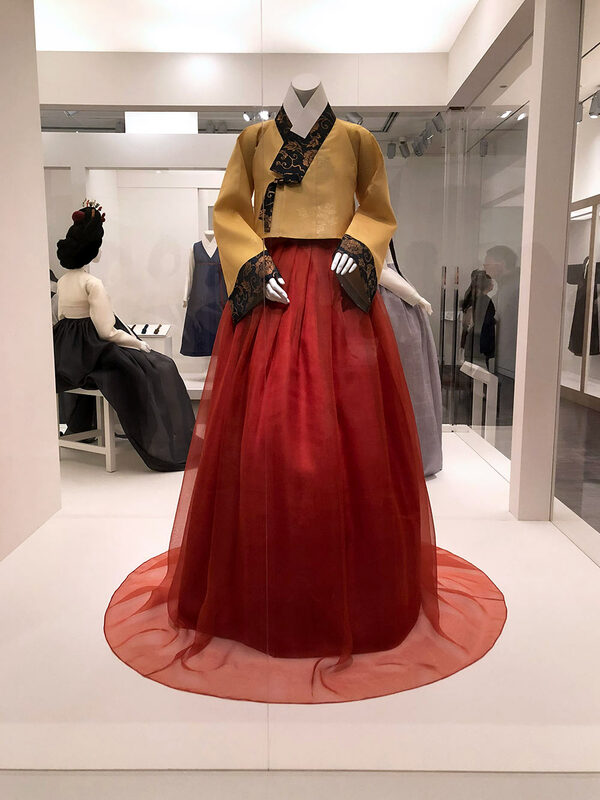 A woman’s hanbok in the autumn colors of mustard and copper. This was one of my favorite pieces. You can touch the fabric! And you can see the clothes from different angles, too. I wish I could dress Connor up in this. Touch the fabric. I know you wanna. 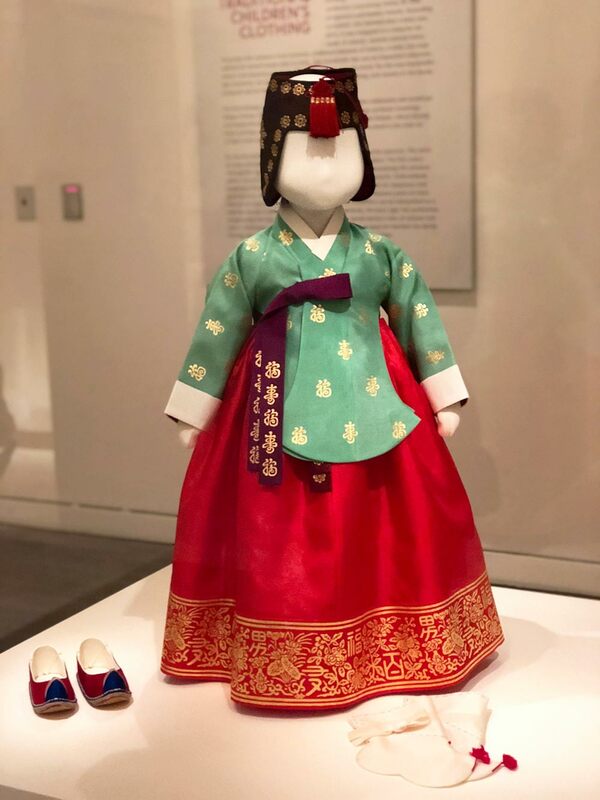 The exhibit is sponsored by two skin care brands — AmorePacific and Sulwahsoo — and runs through February 4th (so just a few more days). 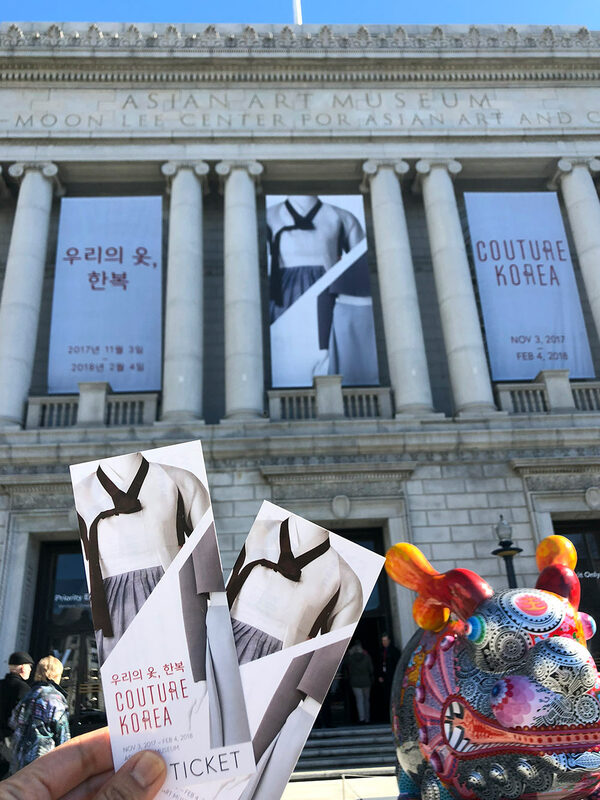 If you’re in the area, tickets to the museum are $15 each (there’s an additional $5 charge to see the Couture Korea exhibit). 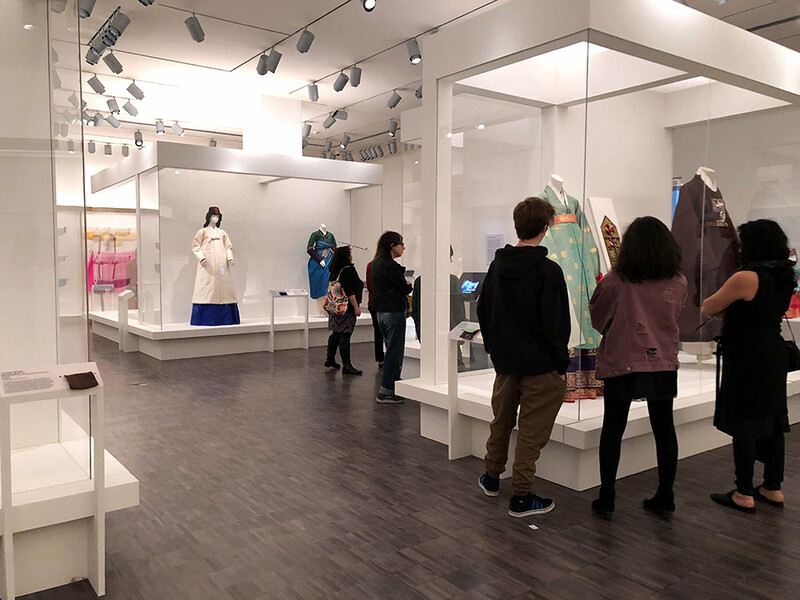 Tickets are available at the museum and online. 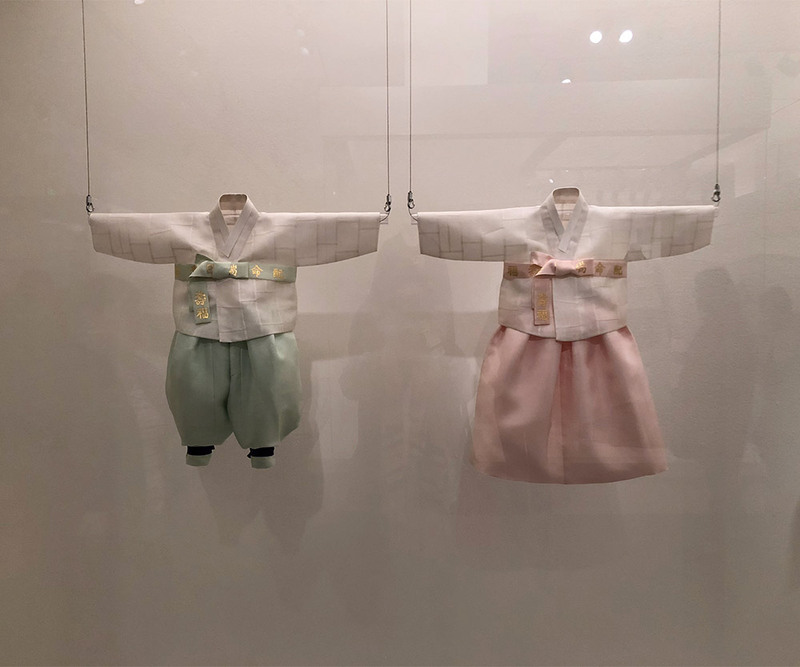 There’s also a lot more to see than the Couture Korea exhibit. There are sculptures, paintings and other works of art from throughout Asia. 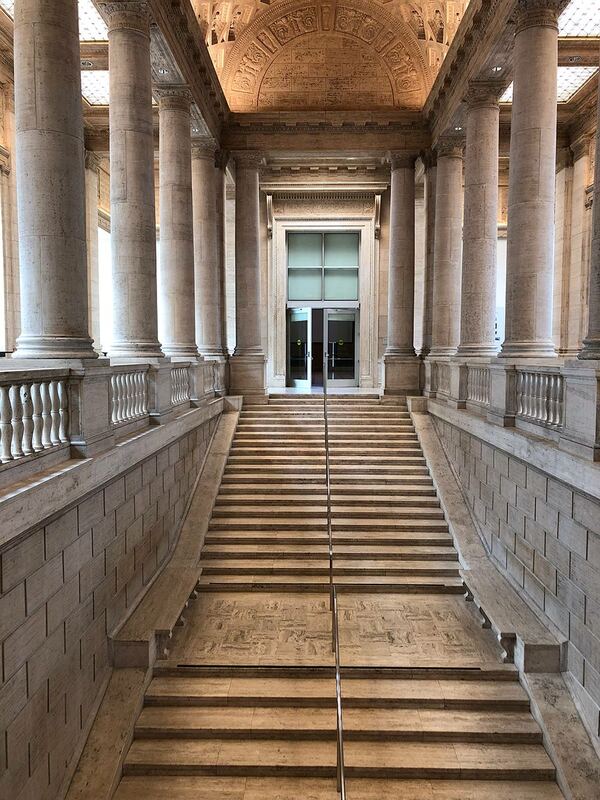 It’s a big museum. Cindy and I got lost on the upper floors a few times. Before heading to the museum, Cindy and I had brunch first at a place called the Outerlands, which is in the Outer Sunset area of the city near where Cindy lives. 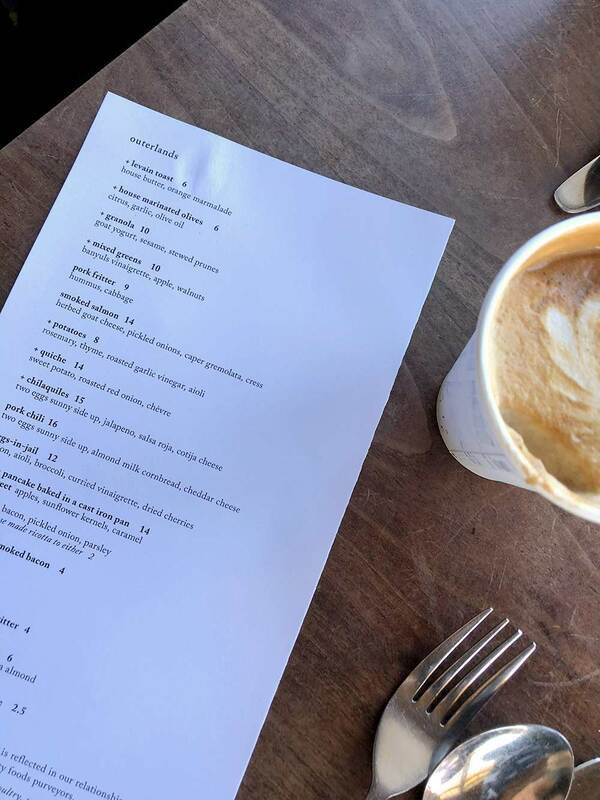 It gets written up all the time as one of the THE places to go for Sunday brunch in SF, and I can’t disagree. I thought it was delish! 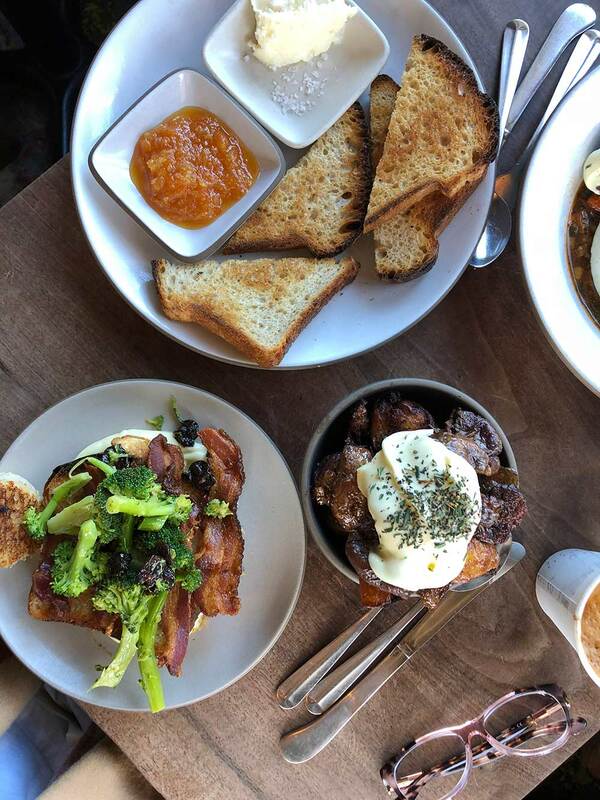 Unusual flavor combinations, too, like I had something called Eggs in Jail, which was a slice of big, delicious sourdough-y bread (which they make onsite) with a hole in it and a sunny side up egg inside, and on top it there was broccoli, bacon and dried cherries (!). The menu changes all the time, so you’re always in for a surprise. Go early if you can to avoid the wait, because the line was long (we got there half an hour after it opened and had to wait 20 minutes to get seated). 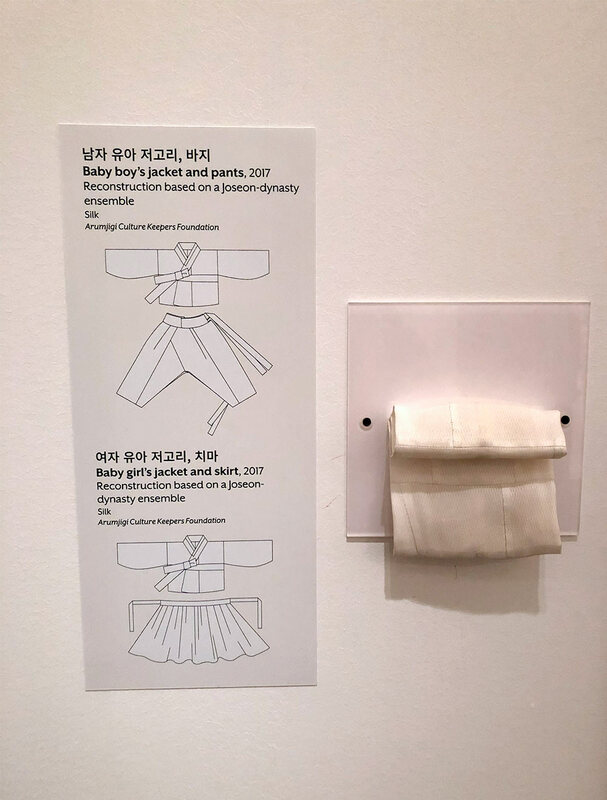 What a beautiful exhibit! Thanks so much for sharing the pictures! You’re welcome! I’m glad you enjoyed them; the clothes are absolutely beautiful. P.S. Were you named after Etta James? I actually want to send my brother this post for the eggs in jail topping combo! He makes eggs in jail all the time for breakfast, and I know he loves veggies for breakfast as well so that seems like a cool combo! And who doesn’t love bacon?? The exhibit looks gorgeous, I wish I wasn’t all the way out here on the East Coast. 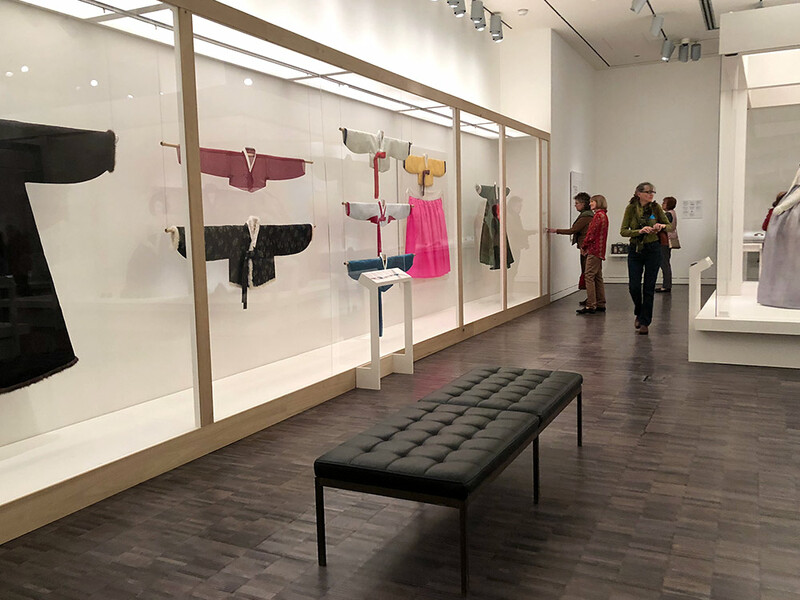 I do love going to the Costume Institute at the Met in NYC, if anyone out here is interested in fashion-related exhibits! You should! 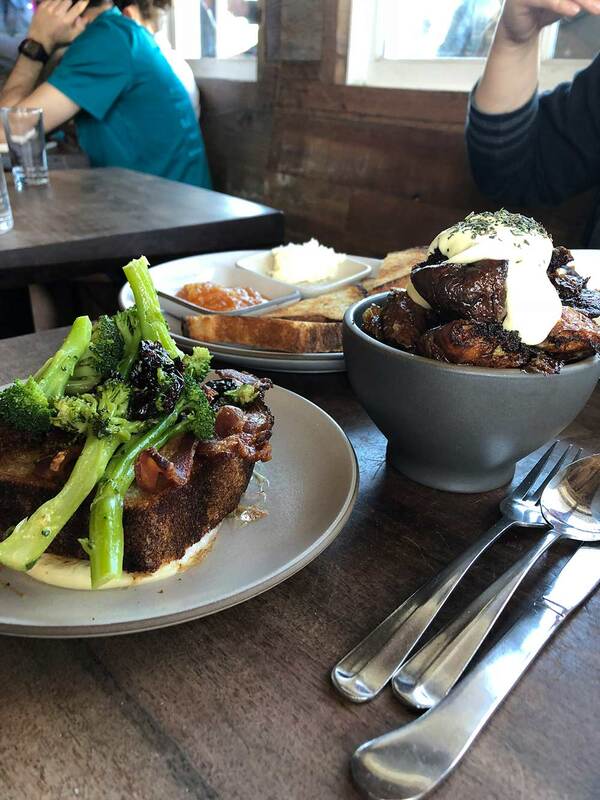 Be sure to mention that there’s aioli at the bottom of the toast and eggs. You can’t really see it in the pics, but it’s there. I definitely will! That’ll add a cool flavor! 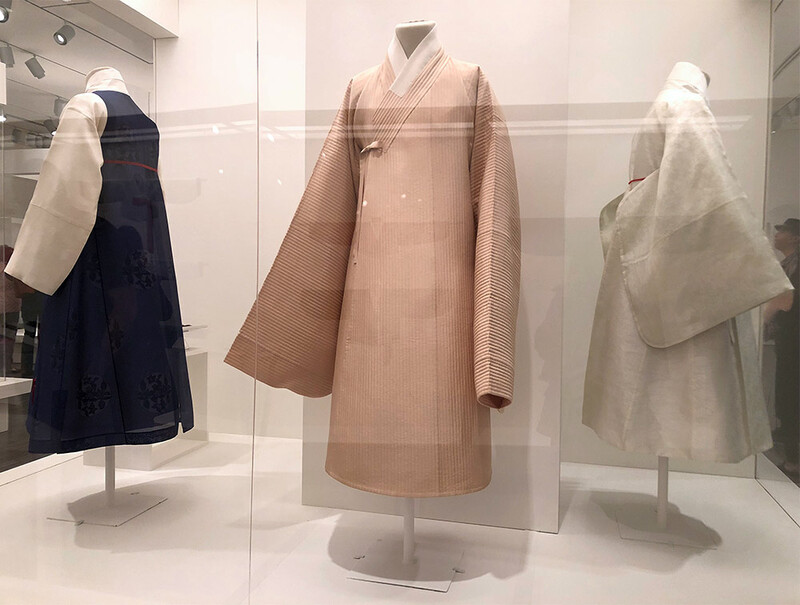 The garments are so beautiful. Patterns and color combinations are just stunning and the way they have them displayed makes them look like origami works of art! Thanks for sharing–everything time I go to SF it’s gridlock city–so I will enjoy vicariously through you! Want the brunch too–but, oh, so far away…lol! It really depends on when you go and what neighborhood you’re in. Generally Sundays, especially before noon, are better. You’ve gotta go up to Outerlands sometime. You can get there easily by taking 280 up to 101. While you’re there, you can explore Golden Gate Park, the Conservatory of Flowers, the Japanese Tea Garden… Make a day out of it! Usually in February all the cherry blossoms are in bloom, too. So pretty! They really look pretty, but pretty uncomfortable as well. I mean, can you imagine running after Connor while wearing something like this? And the kids ones, so precious. The exhibit looks lovely. 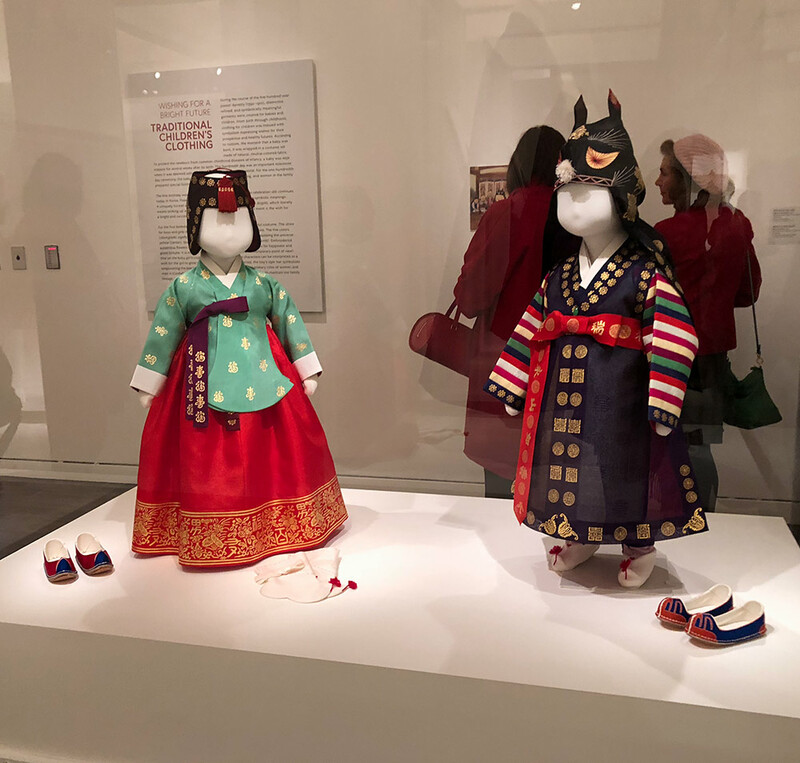 I’ll have to check it out, since I really do love all things traditional Asian dresses. LOL! I have at least 15 Vietnamese traditional dresses and a couple Chinese ones, and my favourite ones are the styles that keep the traditional sense but with slightly updated shapes and fabrics. You’ll probably love this then. The exhibit only runs for a few more days, but hopefully you can make it into the city soon. Oh, my goodness – so many fab things in this post! 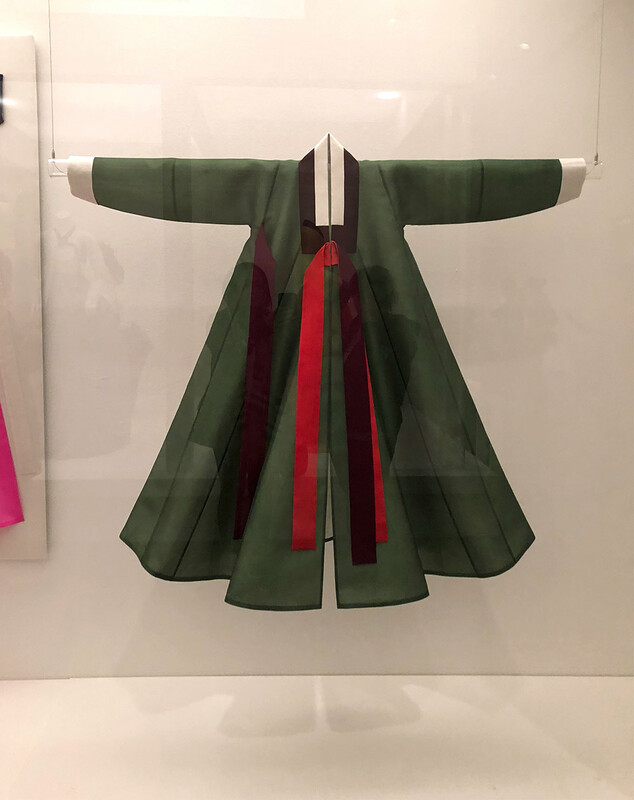 I’m with you 100% on the men’s hanbok. I would have loved a tiger-themed boys’ hat for the fellas when they were little. Or, now. HAHA! The women’s are all beautiful and the details really are amazing. I like the lines of the Mary Poppins fly away one (2nd pic). Hi to Cindy! It’s so nice that you were able to spend the day together. 🙂 Your brunch reminded me to ask how your bread baking went. I saw you had an issue with the proofing – did it work out? 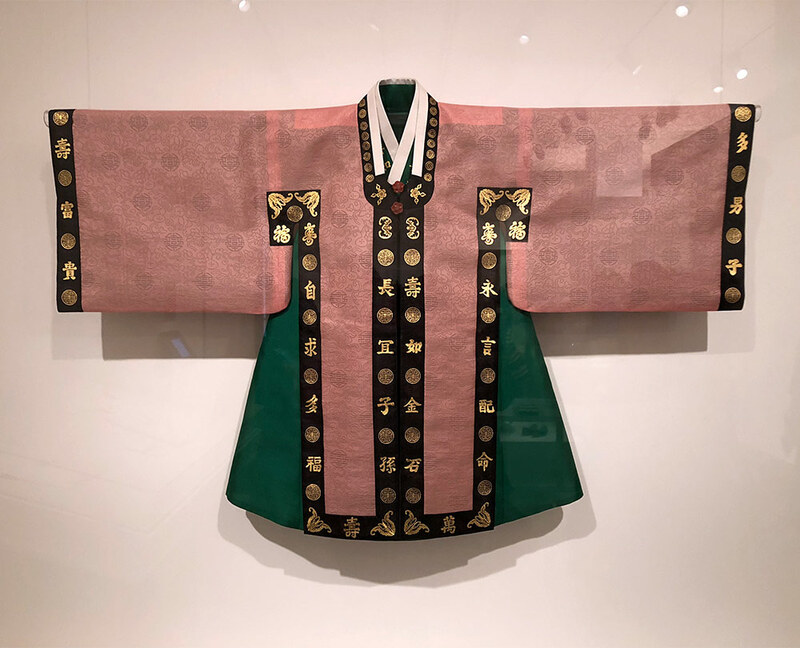 The blush men’s hanbok is awesome, right? I think it’s cool when a man who can confidently wear pink! It’s totally awesome and it was actually my fave. Then I read the caption and thought “oh, of course, men’s”. The women’s are much more intricate, which is very beautiful. I just like the simplicity of the men’s. 🙂 I was surprised to see a neon pink in the “There’s a lot to look at” pic. I would have thought that was a much more modern color. Thanks for sharing all of this – it’s very cool and educational! Great post, wish I was somewhere close to see this. (I guess I could chuck it all and drive up from Missouri!) I think my fave is the copper and mustard one. Oh, the Eggs in Jail? We call it Toad in the Hole around here. Sometimes I get decadent and make two of ’em with a sausage pattie and cheese in the middle and and have a Toad in the Hole sammich! 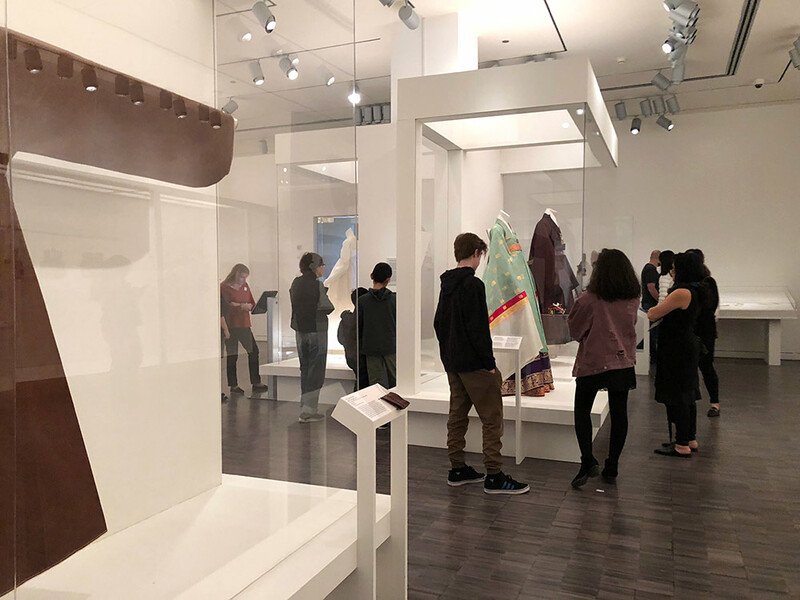 That looks like such a gorgeous exhibit. The fabric swatches were a very cool idea. I’ve been meaning to see that show with my daughter but she’s in Taipei right now and won’t be back before it closes. Sigh. Never eaten at Outerlands. Then again I live with a man who does not do brunch. Another big sigh. One reason I love your blog is that it’s so eclectic. You are a really talented photographer and very creative. I’ve only been to that museum once as I live in CT but would have loved to see that exhibit. Thanks for sharing!